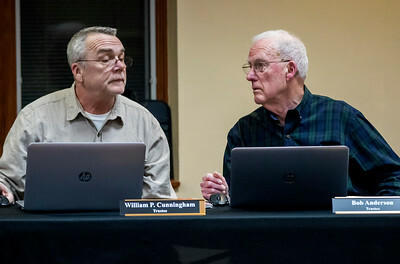 Sarah Nader - snader@shawmedia.com Trustees Bill Cunningham (left) and Bob Anderson chat before Thursday's McHenry Township Meeting Jan. 11, 2018. 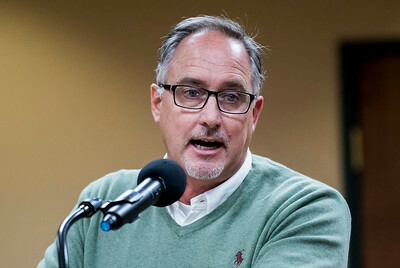 McHenry Township trustees voted down putting a referendum to voters in the November election asking them whether they want to abolish the road district and consolidate it into the township. Cunningham and Anderson both voted yes. Sarah Nader - snader@shawmedia.com Highway Commissioner James Condon spoke during Thursday's McHenry Township Meeting Jan. 11, 2018. 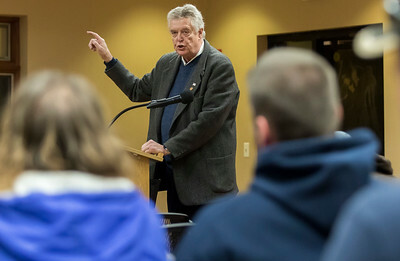 McHenry Township trustees voted down putting a referendum to voters in the November election asking them whether they want to abolish the road district and consolidate it into the township. Sarah Nader - snader@shawmedia.com State Rep. Steve Reick, R-Woodstock, challenged trustee Bob Anderson and his fellow trustees to prove to the people consolidating the road district would actually save taxpayers money during Thursday's McHenry Township Meeting Jan. 11, 2018. McHenry Township trustees voted down putting a referendum to voters in the November election asking them whether they want to abolish the road district and consolidate it into the township.